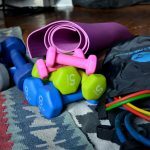 The popularity of resistance bands has increased significantly over the years, but education about their proper use often hasn’t kept up. Although efficient, inexpensive and easy to use, some practical knowledge is needed to avoid breaking bands during exercise. Resistance bands pose hazards just as other fitness equipment, when not treated properly. The two main risks associated with the resistance bands exercising are snapping of the band or letting go of one end while under tension. The result of these actions can cause the end of the band to snap sharply and potentially inflict serious injury. 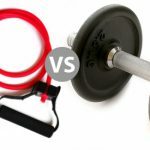 As a result of wear and tear, resistance bands can break down over time. So it is important to inspect them often to ensure that they are in good condition. Also, many of the resistance band exercise injuries come from abuse. Regularly check the bands and handles before every use. It only takes a few seconds to do it, and it’s important because issues can appear suddenly. Look for cracks around the white areas in colored bands, and search for signs of weakness around the handle, in the area where the manufacturers say the bands are more likely to break. Check for cuts, scratches, nicks, discoloration or anything that appears to weaken the band in that area. If you discover defects, immediately discard the band; never try to repair it. When doing exercises that require stepping on the band, make sure to wear shoes made with nonabrasive soles. This avoids damage to the tape. Don’t worry that the chances of the band slipping under your feet will increase, as it won’t. Also, never use a resistance band with bare feet. If you are stepping on the band, do not workout on the floor with an abrasive surface. It could damage it and cause it to snap. Shortening a band for more resistance is a common practice, but it can significantly decrease the life of the band and can cause it to snap. It is safer to buy several bands of different levels of resistance. This will make the bands will last longer. Everything has a breaking point. As a rule of thumb, never extend a band more than twice its resting length. Storage and even the use of resistance bands in hot places can weaken the bands. Avoid moisture and do not use near the pool; the Chlorine will damage bands. Make use of water dumbbells instead. Releasing a band under pressure can cause it to snap back toward the user and cause significant injury. Make sure you have a very tight grip on the handle. 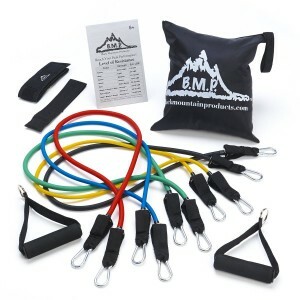 Resistance bands are made from latex, which is a soft material. The band may be damaged when there is friction between the band and a fixed object. It is recommended to use special band anchor for outdoor exercise to prevent harm. In this way, your band will be in contact with another soft material, when stretched. If you leave your resistance bands in direct sunlight the latex can become brittle and more friable. Stretching a dried band will result in easy breakage. Even if you do not keep your resistance bands in dry conditions, they will last much longer if kept well-conditioned and lubricated. 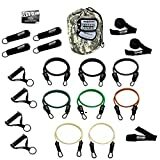 Resistance bands are not toys and should not be used for any other specific exercise activities for which they were not designed for. A resistance band is a great exercising tool, but as with any fitness equipment, proper maintenance is essential to ensure safe and proper function. Do not use soap or cleaning products for cleaning your resistance bands, as they may damage resistance band. The ends of the bands where the handles are connected to the band are weak areas. So do a proper check before each use.